According to Bob Kohn, an attorney and the CEO of Royalty Share, the Tunney Act very clearly requires that the Justice Department publish (and it was thought originally that this meant “print”) all the public comment they got within the alloted comment period. Kohn says that’s what the law states clearly, as upheld in a prior Court decision. That period ended on June 25, a deadline which the government missed. Kohn wrote a letter to the court on Monday to keep the DoJ accountable to the public. It looks like the DoJ backed down yesterday, asking the Court to give them until July 20 to publish comments, at least two weeks before the government files a motion with the judge on August 3. This was acceptable to Kohn, as it was consistent with what he asked for. But he still maintains that the DoJ has been in violation of the law since June 25. To DoJ’s response that what is asked is too demanding — that they need time to review the responses and prepare them for publication — Kohn says “the DoJ can’t have their cake and eat it, too.” He points out that the law allows an extension for DoJ to publish the responses, but only by asking for and receiving an extension in the public’s time to submit responses. If the DoJ didn’t like the law as drafted, Kohn says, they have had 30 years to ask for changes in the law and they never have. Since it appears that the vast majority of the 800 letters received came near the end of the public comment period, it would seem that an extension might have served the public interest. But it wouldn’t have served the DoJ’s interests. And it wouldn’t have served the interests of those who want to use what looks to me like a trumped-up allegation of collusion to ratify the settlement agreed to by three companies (two of which have parent companies that own TV stations and have very good reasons to avoid picking fights with the government that licenses them). I said a “trumped-up allegation” of collusion. Two points stand out to me in making that characterization. One is the inclusion — nay, the trumpeting — of the Picholine dinner in September 2008 as evidence of the conspiracy to implement agency pricing. The evidence in favor of DoJ’s contention is that all six big publishers were in the same room. But the evidence against it is that, at that time, nobody except perhaps a small number of people at Apple knew there would be an iPad, an iBookstore, and an agency model implemented 18 months later. In a word: this “evidence” is ridiculous. The second is the juxtaposition of the fact that Apple told the publishers “unless there are four, there will be no store” (my attempt at memorable phrasing) with the “allegation” that publishers were asking (and telling) each other whether they were in or not. If Apple told them that — which I contend was only revealing to trading partners a pretty obvious and sensible business decision — then the publishers had no need to confer with each other. So suggesting these reports of what one publisher might have said to another proves “collusion” is only slightly less ridiculous than the Picholine “evidence”. Perhaps it is because I’m a Democrat, but I don’t see “collusion” between DoJ and Amazon as the most likely explanation for the suit and the disaster the settlement could engender. What I see is a failure of understanding of what the publishing business is and does, the role publishers and retailers play in it, the impact the Internet is having on it, and what the inevitable impact of forbidding publisher-set pricing will be. I tried to lay that out clearly in a talk I gave last Monday at George Washington University’s fifth annual Conference on Ethics and Publishing. I think the slides are pretty self-explanatory. I hope you’ll give them a look. I want to repeat only one point from that speech here. Amazon’s behavior is self-serving, but it is not evil! It is both futile and wrong to blame something in Amazon’s character for the industry’s troubles. 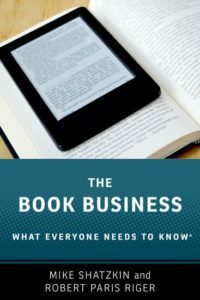 Amazon’s shareholders are not primarily interested in the health and well-being of the book publishing ecosystem; they are primarily interested in the growth of Amazon’s value. It is the job of everybody working there to do what they can to enhance it, within the limits of the law and their interaction with their trading partners. But it is our job as a society, and the DoJ’s job, to think about what the rules of the road should be to deliver what is best for all of us. I have no doubt that if the rules, for example, required retailers to respect all publishers if they wanted to sell on the Agency model and not pick and choose which ones can, Amazon would still do fine. If this settlement is accepted, I’m pretty sure very few of their trading partners or competitors will. There’s a lot at stake. It is bad enough that DoJ has pushed the industry in a direction that strengthens the strongest player. It is worse that they’re doing it in a way that is tending to stifle and reduce the impact of public comment. And if, as Kohn alleges, they are doing it in a manner that clearly violates the letter of the law, that would be adding considerable insult to devastating injury. We had our first free Publishers Launch Conferences webinar yesterday previewing our Publishing in the Cloud conference that will take place on July 26. What was really cool was that a huge percentage of our audience stayed through the entire hour. That tells us that the subject of cutting costs and extending capabilities through Cloud service offerings is one that many in publishing need to know more about. We’re still offering a deep discount ($150 off the $495 full price) through the end of the day on Friday. An impressive roster of speakers and sponsors, most of whom will be available for the “Conversations with the Experts” session, means that all our attendees will be able to get personalized answers about whatever is their concern.